The other week, I had the privilege of addressing hundreds of young entrepreneurs and investors from around the world at the 2018 NEXUS Global Summit. As part of my remarks, I challenged the audience to pursue what I like to call a “congruent life” – making sure your values and passions fully align with your business and investments. My passion for social entrepreneurship developed when I started my first business at the age of five. I would go up the horse trails behind my family’s house, collect manure in a wheelbarrow and then sell it to my neighbors for $1 a load to fertilize their gardens. I’ve been a champion for creative startups ever since. Today, people often tell me that I don’t fit the mold of a typical financial firm CEO. I take that as a compliment. Many financial companies make their investments solely based on performance metrics without taking society into account. I always knew I felt differently. I didn’t want to run a company that turned a blind eye to the problems in the world for the sake of making a quick buck. To that end, I rebranded my firm, Vanderbilt Financial Group, to embrace impact investing. As the sustainable broker-dealer, Vanderbilt now specializes in investments that generate a positive environmental or social benefit alongside a traditional financial return. Since this shift, Vanderbilt has experienced unprecedented growth. In fact, 2017 was our best year ever. Despite some of the challenges encountered along the way, rebranding Vanderbilt was a meaningful achievement in my pursuit of a congruent life. Using my business to make the world a better place wasn’t just some KPI I conjured up to checkoff of a five-year plan. It’s the core of what I aim to do with the rest of my life. That’s why I love speaking at events like the NEXUS Global Summit. I want to inspire, educate and celebrate more entrepreneurs and investors to infuse purpose into their businesses and investments. It’s also why I accepted the role as the Entrepreneurs’ Organization (EO) Global UN Ambassador last year. In this capacity, I help other entrepreneurs use the United Nations’ Sustainable Development Goals (SDGs) – a set of global targets to end poverty, protect the planet and ensure prosperity for all – to integrate purpose into their business to achieve congruence. I believe that highly evolved entrepreneurs are artists, and our businesses are our canvas to share our creativity in business with the world. 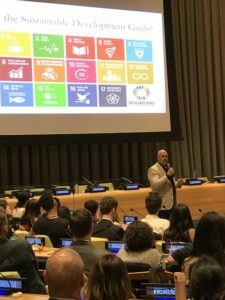 As such, the UN’s SDGs can be our pallet of colors to change the world with our businesses and not only solve challenges in the world, but create a more purposeful life for us, the artist entrepreneur. Experts estimate that $90 trillion is needed to achieve the SDGs by 2030. Philanthropy and government intervention alone will not be enough to meet the UN’s vision. The business community will need to step up, and entrepreneurs are in a prime position to make the most impact through innovative solutions that tackle the challenges outlined in the SDGs. Collectively, we can make a world of difference and in doing so, help to pass on to the next generation a better world.